It is ignored in the west, but Christianity is the most persecuted religion. Why is there such silence on the issue? Iwas up before dawn this morning, preparing for our first service of Easter. This meant that, around the same time as bombs were going offin churches in Sri Lanka, I was reading a passage to my congregation taken from the book of Ezekiel. The passage tells of dead bones coming back together, of bodies being re-clothed in flesh and of life being breathed back into them. Over in Sri Lanka, bones were being blown apart, and flesh stripped from skin. These people woke up this morning full of hope, excited in anticipation of the story of Jesus’s resurrection. They put on their best clothes and polished their shoes. Now their blood is being mopped from the sanctuary floor. I was talking the other day to the classicist Mary Beard about Christian persecution in Roman times – all that stuff about lions and the Coliseum. She was of the opinion that it might not have been quite as big a deal as later Christians made it out to be. And no doubt there is nothing quite like a few over egged stories of gory martyrdom to deepen a sense of group solidarity among a struggling religious community. Well, I bow to Mary’s greater knowledge of classical Rome. But while it may have been true that too much was made of Roman persecution, the very opposite is true now. We are living though one of the most serious phases of Christian persecution in history, and most people refuse to acknowledge it. During the past century, Christianity has been all but driven out of the Middle East, the place of its birth. This time last year I was in Damascus, visiting the Christian community there. On the front of the church that I went to on Sunday morning there was a huge mural depicting the horrors of the Armenian genocide. These Christians were originally refugees from Turkey, and had arrived there fleeing the most sustained and horrendous persecution. How much of this story do we know? This week, the Israeli historians Benny Morris and Dror Ze’evi will publish a much-awaited account of the period. The Thirty-Year Genocide: Turkey’s Destruction of its Christian Minorities argues that from 1894 to 1924, the Turkish authorities systematically murdered some 2.5 million Christians. At the beginning of that period, in places like Anatolia, Christians accounted for 20% of the population. By the end of it, there were just 2% left. Throughout the 20th century and into the 21st, Christians have been driven from the Middle East with bombs and bullets, and with hardly a bat squeak of protest from the secular west. Why no outrage? Yes, these horrendous murders will make the press for a day or two – but we generally care more about the fire in a famous cathedral than we do about those people who have their bodies blown to bits in architecturally less significant places of worship. Why the blind spot – especially given that we do care about so many other forms of oppression? No, it’s not a competition. But I do wonder whether on some unconscious level the secular and broadly progressive west thinks that Christianity had it coming. They associate Christianity with popes and their armies, with crusades and inquisitions, with antisemitism, British imperialism, Trump supporters and abortion protesters. Christians in the west haven’t helped. By describing as “persecution” the minor run-ins that Christianity has had with the law – about cakes for gay couples or street preachers, for example – Christians have debased the word persecution and made it sound like a manipulation designed to reclaim some lost place in the culture. Moreover, porky and pink-faced bishops in the House of Lords do not look like a persecuted species, and so when they talk about Christian persecution they look faintly ridiculous. And maybe there are some who don’t want to talk about Christian persecution because they fear that it could easily be used – as it sometimes is – as an alibi for Islamophobia. Easier to fall silent about the murder of Christians than to be seen to side with those racists who blame Muslims for everything. I understand this – but it’s still not good enough. According to the widely respected Pew report, Christianity remains the world’s most persecuted religion. And the only reason for mentioning this so crassly in terms of league tables is simply that it serves to highlight the deafening silence of our response to it. From North Korea (OK, obviously) to China, and increasingly even in places such as India – all around the world Christians are subject to real and sustained violence for the profession of their faith, the one that we proclaim most insistently today. That life is stronger than death. That love will ultimately triumph over hate. And this means that we believe terrorism can never quench the proclamation of the good news of Easter. At Easter, darkness doesn’t have the last word. That is why people were going to church in Sri Lanka in the first place, to listen again to this message: Christ is risen. Allelujah. Should Donald Trump Apologize For Telling The Truth About Islamic Relations? In an interview with CNN’s Anderson Cooper that aired Wednesday night, Trump was asked whether he thinks Islam is at war with the West. The statement drew swift condemnation from the Council on American-Islamic Relations, which called on Trump to apologize for the comment, as it has in response to other comments Trump has made. 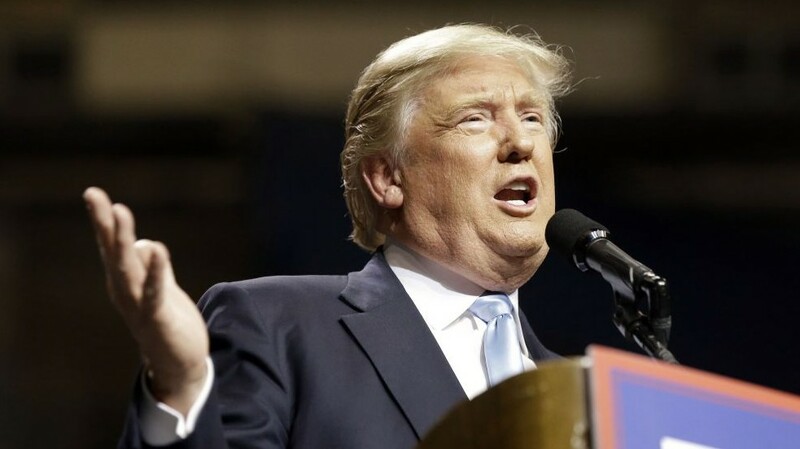 “Donald Trump’s anti-Muslim rhetoric does not reflect leadership, but instead reflects a bigoted mindset that only serves to divide our nation and the world,” Nihad Awad, the group’s national executive director said in a statement. The group suggested Trump could do so at Thursday evening’s GOP debate. Scott instead shifted his answer to more general themes, calling Florida “the best melting pot in the world” and saying: “We love everybody coming to our state.” The avoidance prompted host Mika Brzezinski to suggest ending the interview early. The questions come as Trump continues to dominate the Republican presidential contest, locking up delegates, despite a series of controversial statements. Trump has called for a temporary ban on foreign Muslims entering the US and has advocated “going after” the wives and children of suspected Islamic jihadists in the wake of the Paris and San Bernardino attacks. Critics have argued that Trump’s plans would only exacerbate problems by alienating more moderate Muslims. Trump and other Republicans have criticized President Barack Obama and the Democratic candidates for failing to use the term “radical Islamic” when referring to Muslim jihadists or attacks by them. Trump was also pressed on his vow to work to “broaden” laws restricting waterboarding and other enhanced interrogation techniques if he’s elected president in order to level the playing field between militants and the US. CAIR claims that the rhetoric of Trump and other Republican officials is at least partially to blame for a spike in anti-Muslim incidents across this country in recent months. 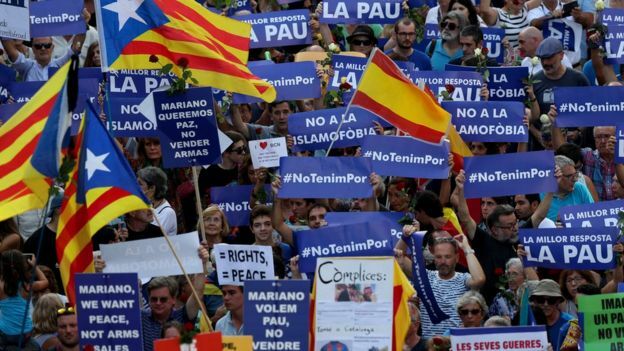 Hundreds of thousands of people in Barcelona have marched against militant Islamists who left 15 people dead in and around the city last week. King Felipe VI led the demonstrators, alongside Prime Minister Mariano Rajoy. The king is the first Spanish sovereign to take part in a demonstration since the monarchy was re-established in the 1970s. Emergency workers and shop staff who helped during the attack at Las Ramblas also took pride of place. The procession set off behind a banner bearing the slogan “I’m not afraid”. Other placards denounced Islamophobia. 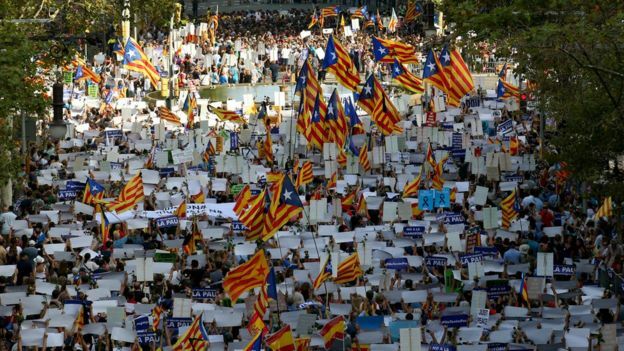 During the march, the king and prime minister walked the streets in front of hundreds of Catalan flags – the emblem for the autonomous region’s long-running independence claim. Some protesters whistled and shouted “out” at the king. Where do the attacks leave Catalan independence? Who are the Barcelona suspects? Catalonia, of which Barcelona is the capital, is due to holds its unrecognised independence referendum in October. 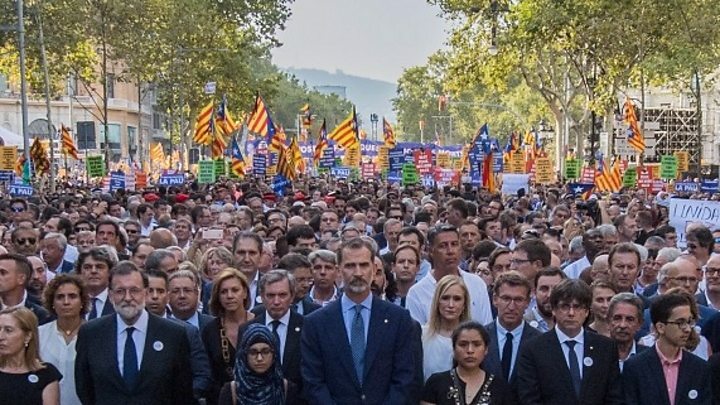 Prime Minister Rajoy had encouraged “everyone” to take part to show that “Catalonia and the rest of Spain [are] united against terror”. The 17 August attack – which saw a van deliberately driven into people on the Las Ramblas boulevard – was claimed by the Islamic State group. The driver later stabbed and killed a man while hijacking his vehicle. Hours later, a car attack in nearby Cambrils killed another woman. A cell of 12 jihadists has been blamed for the attack. Eight are dead, while four have appeared in court in Madrid. King Felipe has reigned in Spain since 2014, when his father, King Juan Carlos I, abdicated. Spain’s monarchy was restored after the death of military dictator Francisco Franco in 1975. Quebec’s legislature unanimously adopted a motion Thursday condemning “Islamophobia” — particularly toward Syrian refugees — in response to what some politicians say is a growing anti-Muslim climate in the province. About 100 members of the legislature voted in favour of the motion tabled by Francoise David, whose Quebec solidaire has three members in the 125-seat national assembly. David said she was concerned by what she called the increasing number of attacks against Muslims in Quebec, notably online. The motion condemned Islamophobia and incitement of hatred and violence toward Muslim Quebecers, in particular Syrian refugees. The governing Liberals and the two other opposition parties in the legislature attempted to amend the motion in order for it to condemn racism more generally as well as other forms of intolerance. But David told reporters she insisted the word “Islamophobia” be included in the text and that the motion focus on Muslims. Except when Muslims are attacking, killing or inciting violence against non-Muslims in Canada. Then the spade must be buried, hidden and hushed. Perhaps, now, even punished. Absent in the motion was any mention of the niqab, the face veil worn by some Muslim women that has become a major issue in the federal election campaign, particularly in Quebec. Political parties are split over whether people should be allowed to wear the veil during citizenship ceremonies. David pleaded with her federal counterparts to stop talking about it and to focus on other topics. In other words, they are busy debating distractions and nothing of importance to long-standing citizens of Quebec. Can any Canadian reader let us know what legal standing a “motion” holds in Quebec? It is difficult to tell Americans anything right after an election hangover. Christians slumber and since they expect the new president to be like god believing that he will solve all their woes, they go into hibernation just as when Christ left His disciples at the Garden of Gethsemane. With republicans, when their god Reagan told the Russian god, Gorbachev “tear down that wall” they all clapped. And now their new god (Trump) tells the Mayan god “we will build a wall and you will pay for it” and they all clapped. I avoid opinions from the jeering crowd that loves to clap after every sentence their god proclaims. They clapped during Reagan, when a wall was torn down that was meant to keep Nazism locked up and they will clap when another wall is erected. Mesmerized crowds are not a good source of wisdom. Trump will intend well. No doubt. But will he fully comprehend the real cunningness of the enemy? Here is a simple challenge to the jeering crowds. Americans clapped when their idol, Ronald Reagan, sent weapons to Muslims in Afghanistan to fight the very Russian communists whom they rightly hated. But at the time they did not comprehend the cunning religion of Islam which we warned about will arise as a result. They were void of any wisdom. So they armed the Islamists to fight the Russians and now we have as a result, Al-Qaeda, the Taliban, ISIS and an Islamist revolution in the Middle East. Was Reagan “smart’? Yes, but obviously he was naive when it came to facing the devil of Islam. Trump now says: “I am a really smart guy” and “I will destroy ISIS”. Okay, but to combat the devil, one has to be as wise as Daniel, not just “smart” as Reagan was and as Trump is. This unwisdom will not cease in this new presidency as you will see Trump cozy up to Erdogan. Take Lt. Gen. Michael Flynn, a vice chair of the Trump transition running for a top national security post. Some on the left accuses him of being an Islamophobe. This is false. Flynn runs a consulting firm that is lobbying for Turkish interests. The Daily Sabah, which is an Erdogan mouthpiece denies such allegations. Why? Because they love Flynn’s love of the Turks. So which media do you want to believe; the conservative, the liberal or the Islamist Turks? It is here were wisdom is needed. Flynn’s argument begs the question: if Islamism is the obstacle to peace, Erdogan is a global Islamist. And if Obama was the “obstacle” to the world’s greatest Islamist, this would mean that we should praise Obama for “keeping Erdoğan’s government at arm’s length”. This senseless thinking will not change under Trump when it comes to Turkey. I remind, it was Mike Pence’s hypocrisy that sold out the Christian Armenian Genocide to please Turkey. Exposing this under Obama was fine, but now, with Trump, it will only gains us a “pro-Obama” label. Under Trump, the slander from the jeering untrustworthy crowds will not minimize and in fact will increase. These were the same crowds who said that Reagan was smart in 1983. I believe that he was a great president like Trump will become, but Reagan made serious errors. May I remind the jeering crowd, that when Muslim Hezbollah blew up the marine barracks in Lebanon on October 23rd 1983, where nearly 300 of their best and finest marines were slaughtered; did Reagan dare arise to confront Islam? No. Their favorite idol simply tucked-tail, pulled out the troops from Lebanon and ran. Yet they still clapped because exactly two days later, Reagan diverted attention by invading Grenada. Reagan did not want to mess with Islam. Hezbollah got away. And now we hope, pray and clap, that our new idol, Trump, says he will kill some prostitute goddess named ISIS? He will give the mission to Turkey. Guaranteed. May I remind, today, as a result of their other dead god, Reagan, with his war on Russia, we still have the Taliban, and the jeering crowd still worshiped the dead idol Reagan and they still clap while they hang any critique for blasphemy. Trump is aware of this and is now mending with Russia. This, as many hate it, will be a good decision by President Trump. I, many times, said on Radio and in my speeches “do not touch Iraq” and the jeering crowd looked at us Middle Eastern Christians with scorn. Trump (whom we predicted will win when he only had 4% approval) was right on this one and he had the sense to denounce it at the time. Americans at the time worshipped Bush, the Father, who invaded Iraq and then they worshipped Bush the Son who completely destroyed Iraq while the jeering crowd clapped with shouts of hip-hip-hurray. As it turned out, it was all based on a manufactured lie about some chemical weapons that the Babylonian god, Saddam, supposedly stockpiled so that someday this god rains fire and brimstone on the U.S. It took decades for the clapping mesmerized crowd to wake up and smell the coffee while they all cursed us, the ones who correctly predicted the outcome of things to come. Then a strange Cushite African god, Obama, (who mesmerized the same foolish crowd), this one springboard from the Bushes catastrophe in Iraq, he moved on the same path of destruction towards Libya and Syria while causing havoc in Tunisia and all the way to Egypt. It sent an Islamist shockwave devastating the entire Middle East where Islam re-arose by the neo-Ottoman Turks, exactly as we predicted will happen in our books. The Cushite god was hated, along with the two burning Bushes, but Reagan was the god who got away to be praised and worshipped till Kingdom comes and reveal he too was a false god. So here is my honest to goodness detailed opinion in an essay on what will happen during the era of this new god while this new cunning religion arises upon the earth: the new Islam. The findings will shock you to a place of no return. It will reveal the true reality at hand and what Trump will face. You will finally understand what cunning is like from an x-cunning devil who was himself a wolf in sheep clothing. Decades from now you will re-read this to realize it will all happen just as we projected. As you read, you will run into arguments saying “so what” and “this is no major deal”, but continue, the devil wins when he succeeds in planting a kernel of leaven which Christ warned will “spoil the whole batch”.